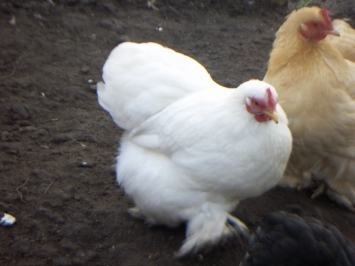 Having gotten so much enjoyment from the battery hen’s, and suffering persistent pleas from Megan for a new pet, Derrick decided that whilst we were not in the market for a puppy or a kitten, we could do with some pet chickens! I had fallen in love with a Mother Hen and her chicks whilst we were on a summer break in Plymouth last year and upon researching found that they were Pekin Bantam’s. Smallish, cute, fluffy chickens with feathery feet! And so the seed had been sown some months before. Derrick sourced a place, Smiths Nurseries in Thorngumbald near Hull, that had some Pekin Bantam chicks that were ready to be taken on. We reserved two, a lavender and a lemon coloured ones. The day came to go and pick them up and Megan was very excited as she loves all baby “animals”. The nursery had a variety of poultry to look at and we spent an enjoyable half an hour looking at the selection of ducks, chickens and their chicks. There was a rather magnificent cockerel that certainly knew how to make people take notice of him! He was so loud with beautiful feathers. A handsome creature. If we had more space......and no neighbours to irritate.......I would have snapped him up at the rather reasonable £30 he was on offer for! After a good look around and a lot of “Ooohing” and “Ahhing” at the cute chicks and ducklings, we were ready to take our new editions. Our lavender and lemon chicks had already been earmarked as we had stated that we specifically wanted all females. They were so cute, but so were the other ten or so that were in the pen with them. And me being me and with Megan egging me on....(Ha! Egging?! Get it?!) I succumbed and selected a white chick and a black chick to complete our collection. And so we packed them in the car in the back with Megan who was in charge of looking after them and began the journey home. Oh, and of course it was the perfect opportunity to pick up some manure on the way too! Megan giggled all the way as the chicks kept sliding about in the pet carrier they were in and kept sitting on each other! 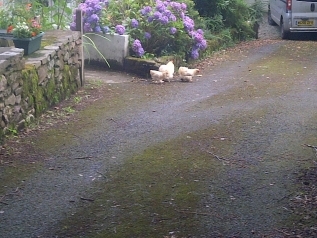 Back at Priory Cottage, the Pekins were transferred to their new quarters and so their new life as our pets began. Naming the bantams has taken a while as I truly believe they have different personalities and traits. The task was left to me as it is not Derrick’s thing and Megan was at a loss! She is so white and fluffy and reminds me of candy floss. 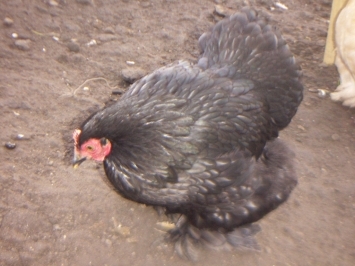 She is the feistiest bantam and certainly doesn’t take any nonsense! Oscar got quite a telling of from her on the occasions that he dare walk past their pen! Poor Oscar, he was only saying hello. He is too old for chasing chickens these days! She is probably the most skittish bantam we have. She is easily spooked and nervous when separated (albeit of her own volition!) from her mates. 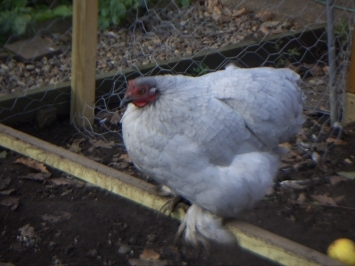 This is why I named her Pearl, as she looks like a little old lady.....especially with the blue rinse colour! Black Pudding! This little monkey is very mischievous and can on occasion be a bit of a bully. I don’t think she means any harm, she just gets a bit carried away and you can see the others just walk off! She has targeted the ducks and we have had to separate them for the time being to avoid distress. Pudding and Floss tend to work as a double act. They are the ring leaders and the ones most likely to be in trouble! My favourite. I know I shouldn’t have one but let’s face it, if were honest, we all have favourites in life. I think she is more of a peachy colour than lemon hence the name “Melba”. 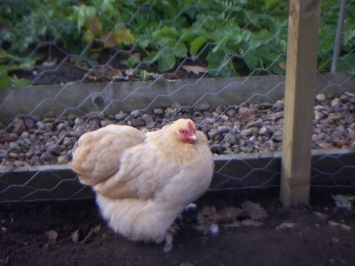 She is a beautiful and very cute hen. Cheeky but not naughty and with the nicest temperament. If she would let me, I would pick her up and cuddle her!